Rachel Estapa, the creator of More to Love Yoga, leads a class in Somerville. As she guided her yoga students through different postures and meditation exercises, Rachel Estapa took a moment before introducing child’s pose. 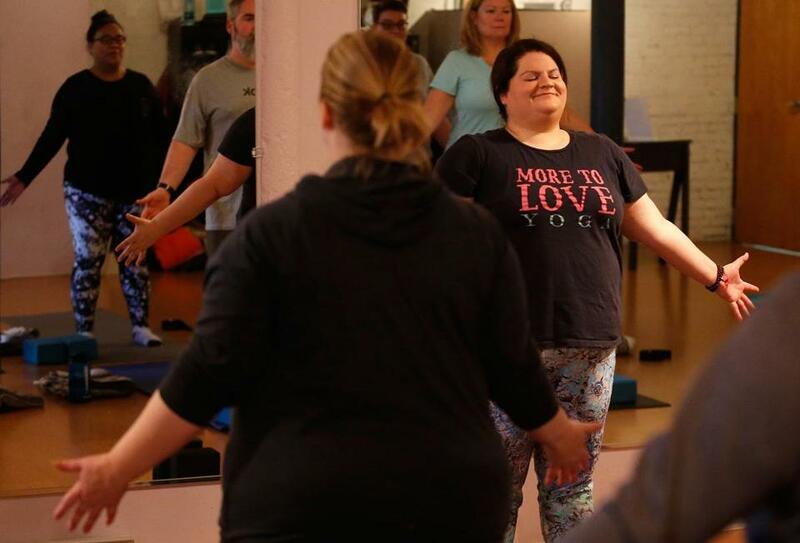 That frankness and honesty reflects how Estapa approaches fitness and what led her to create More to Love Yoga, a Somerville studio that emphasizes body acceptance. More to Love Yoga encourages would-be yogis of all shapes, sizes, and fitness levels. By employing body-positive philosophies and taking the focus off competition, Estapa hopes to combat what she sees as Boston’s one-size-fits-all fitness mentality and, instead, create a space that feels welcoming to all. When Estapa tried yoga for the first time, she learned a hard truth, she says: Many yoga studios don’t follow a curriculum that’s plus-size friendly. “I thought I was bringing everyone down and my teacher didn’t know how different bodies worked with different poses,” she recalled. She remembers feeling uncomfortable when she needed foam blocks (used to help people balance or provide extra support) and none of the people around her did. In 2013 she started a More to Love Blog, and two years later she found a studio space to hold in-person classes. Johanna Bischof, 27, found Estapa’s class by way of Germany. While in Dresden, Bischof looked at More to Love’s virtual programs, and when she moved here and discovered that Estapa’s classes were nearby she stopped by for a class. About 18 months later, Bischof says that having a teacher who looks like her has made all the difference. Bethany Baker, 35, of Cambridge, said that she found the class after she felt like there was too much of a “spotlight” on her at gyms filled with active and fit people. Baker Googled “plus-size yoga” and “body-positive yoga” in the area. She was disheartened by the lack of plus-size studios that popped up on the Google search, until she found More to Love. For now, Estapa’s classes are capped at 15 people, a limit she wants to keep because bigger classes feel too staged, too much like a performance to her. Now Estapa, who lives a little more than a mile away from her studio, is working to raise the profile of her More to Love studio. That has been helped along by the $25,000 she won in early December through MasterCard’s “Grow Your Biz” contest. She hopes to use the money to make her company more sustainable in a competitive market for new up-and-coming yoga studios. More to Love competes with a variety of yoga studios in Boston and beyond, where lithe and agile classgoers, many sporting Lululemon togs, are not uncommon. While not every yoga studio holds body-positive yoga classes, many do cater to participants who might not feel at ease in a more competitive fitness environment. Tatyana Souza, the owner of Coolidge Corner Yoga in Brookline, says she began offering Gentle Yoga for people who wanted a more mellow class experience. It caters to yogis of all shapes, sizes, ages, and fitness levels. Souza added that she would like to see greater diversity in the yoga community, including yoga instructors.